The Wave® SoundTouch® music system is part of an entire family of wireless products, from one-piece music systems to home cinema. They all work together to play the same music in every room, or different music in different rooms. 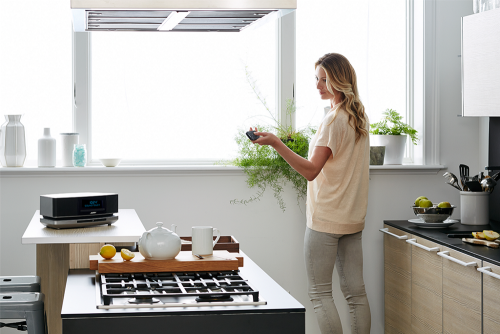 With SoundTouch®, you can discover and enjoy music more effortlessly than ever before. The Wave® SoundTouch® system sets up easily in minutes. The app helps walk you through the steps. Regular or home-burned CDs/MP3 CDs load directly into the front, and your streaming music sources and AM/FM stations are available at the touch of a preset. A slim infrared remote control lets you operate all system functions from anywhere in the room, and the convenient touch-top controls for on/off/snooze are completely invisible. You hear your music with clear, full, accurate sound. 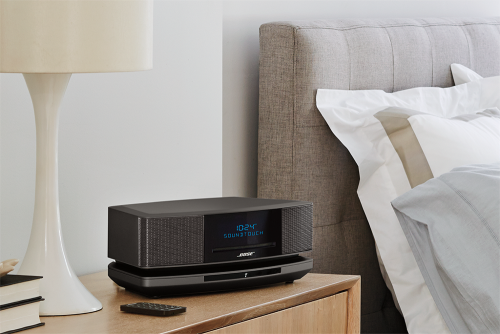 All from a music system that fits virtually anywhere: living room end table, kitchen counter or bedside table. Proprietary Bose® technologies automatically perform many of the adjustments needed for high-performance audio. So you can enjoy the performance of a large, multi-component stereo without a row of controls. The large, easy-to-read display shows the music source, time and more. And the dual alarms are great for working couples who have to wake up at different times. If you like to snooze in the morning, just tap the top of your system to buy some extra time.